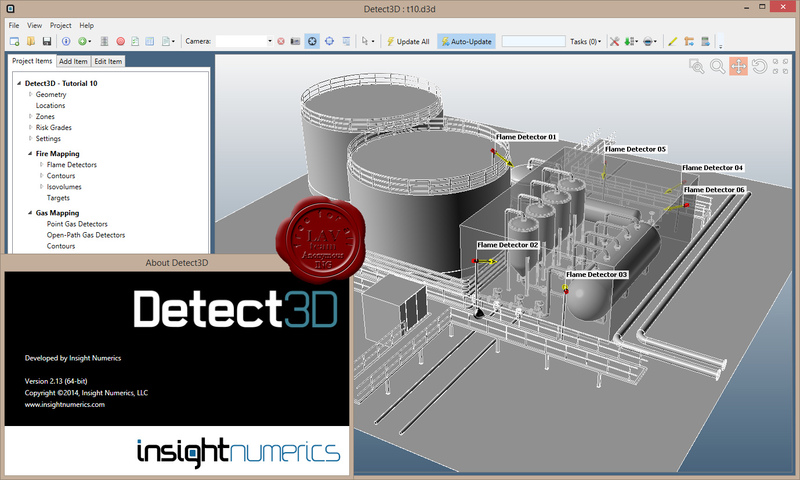 Detect3D is the most accurate and trusted 3D fire and gas mapping tool for the design and assessment of detector layouts. Using the integrated design environment, line-of-sight flame detectors, and point and open-path gas detectors can be interactively positioned and oriented within any geometry. The user can highlight zero-visibility zones and interactively adjust the position or orientation of the detectors and receive real-time feedback. 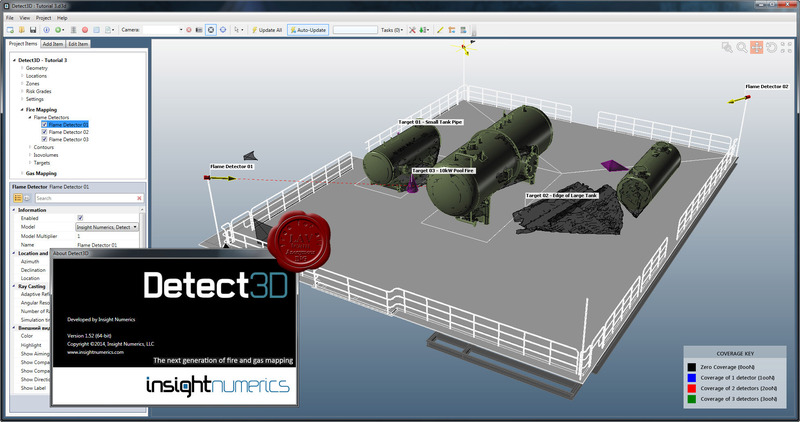 Detect3D is the ONLY fire and gas mapping tool on the market that can be installed on Windows workstations. 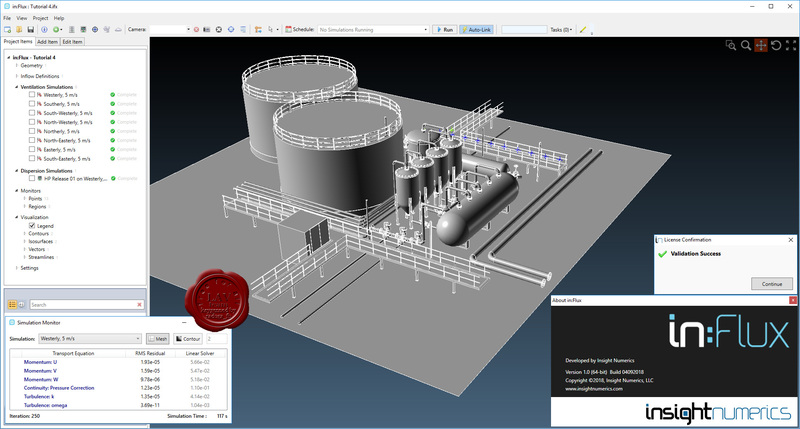 Import CAD in Microstation (.dgn), Autodesk AutoCAD® (.dxf), STEP, IGES, OBJ and Stereolithography (.stl) formats. Define multiple fire zones and assign hazard categories for each one. Export the isovolumes to CAD so they can be loaded back in to your CAD software. Output auto-generated reports showing coverage statistics for each fire zone in pdf and MS Excel formats. All obstructions are accounted for automatically - no need to represent the geometry using simplified primitive shapes such as spheres and cylinders. What is in your CAD file is what will obstruct the detector. The obstruction of the detector's field-of-view (FOV) is accurately calculated in full 3D by casting thousands of rays. Import flame detectors from our manufacturer's database or create a custom flame detector field-of-view. Interactively re-position or re-orient detectors and receive immediate feedback for the improved layout. Add detectors one at a time or add them in a one or two dimensional array to expidite your design process.Quickly highlight zero-visibility areas within each fire zone using 3D isovolumes and 2D contour plots. Using technologies akin to that used for concert hall design, Insight Numerics is in development of algorithms to quickly assest the acoustic soundscape of process areas to enable engineers to optimally position acoustic gas leak detectors. in:Flux is CFD software that analyses ventilation and gas dispersion within complex geometries. It is aimed at all engineers, including those who have never previously performed a CFD themselves. The speed and simplicity of in:Flux is unrivaled. Organizations can now carry out CFD modeling at a fraction of the time and cost associated with other CFD products. The only CFD software specifically designed for dispersion and ventilation analyses, eliminating the need of expertise to ‘tweak’ general purpose codes. Interface directly with many CAD formats (DGN, DWG, DXF, IGES, STEP, OBJ, STL), no approximations are made to the CAD geometry. All meshing, boundary conditions, and numerical setup is automated. Post-processing visuals can be added after calculations have finished rather than hope planes defined prior to the simulation contain relevant information. Once the process is understood, multiple simulations can be set up very quickly as simulations are automatically scheduled without the need of scripting. Add detectors one at a time or add them in a one or two dimensional array to expidite your design process. Quickly highlight zero-visibility areas within each fire zone using 3D isovolumes and 2D contour plots.